Let the head banging begin! You know you're getting old when you're fan-girling over a rock band that's in their 60s. Attending an AC/DC concert has been on my bucket list for around 20 years. Their previous Australian tours came at times where we either weren't financial or I had a baby on my hip. Well, I'm not getting any younger. Nor are they! After missing their 2010 tour I declared I'd hock our possessions to get a ticket to their next Aussie tour. It turns out I don't have to. They'll be back in Oz in November and I got tickets for my birthday! It's their Rock or Bust tour and I am praying to the head banging Gods that there'll be more rock (less bust) in the old Acca Dacca dudes. Actually, I'm praying to the head banging Gods that there'll be enough rock left in me too! I have the tickets in my hot little hands and unless the Acca's die between now and then (or they procure a murder ... really Phil Rudd?) I'll be ticking off a big ol' life experience from my bucket list. I'm not sure I'll be actually head banging though. That's a hell of a migraine right there. I will be singing. I will also be jumping up and down on the spot like a pogo stick and screaming a lot. And sweating. I may tease my hair into a curly perm-like boof (with the sides gelled back) and wear shoulder pads. Or maybe black jeans and a black singlet with my bra showing. Or not. Actually, I don't know what I'll be doing or wearing, but I do know I'll be dragging my husband along for the ride. 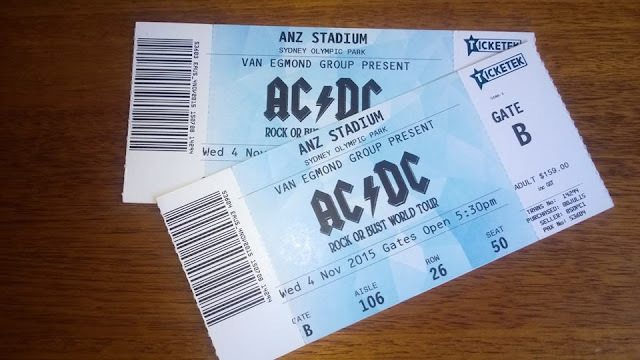 AC/DC here I come! Thanks Mum and Dad. Are you an AC/DC fan? Do you have a band on your bucket list? What does one wear to an AC/DC concert? Agree with Amy on the comfy shoes! So we're in this oldies thing together than Dani :) Good to hear! Ah I LOVE AC/DC!!! How awesome!. As lidia said, just wear black. Flat shoes. Take throat lozenges! AC/DC are a fabulous band, I'd love to see them live. Enjoy rocking out! I have to say that Coldplay are on my bucket list, I would love to see them live! Seriously though, you must tease and gel your hair for the concert and please, please, please post a photo so we can, that would be awesome! They're not for everyone that's for sure. They are such a part of my teen years (and beyond) ... hubster saw them live years ago, before we met. Have an awesome time!